We are doing some recycling and celebrating May Day at the same time at our house. 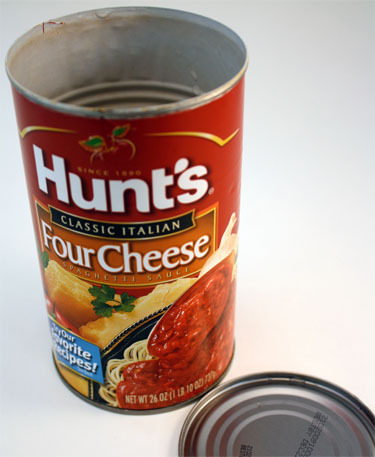 These taller pasta sauce cans are perfect for May Day Baskets (smaller cans could also be used). Since the cans are water tight they are perfect if you are using fresh flowers. Since we are making “flowers” a variety of non water tight containers could be recycled and used. 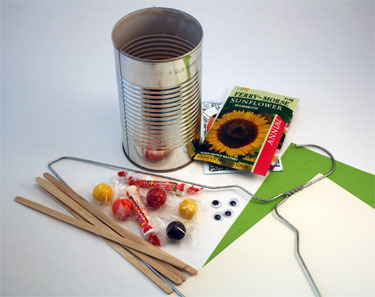 Gather up some cans, a coat hanger for the handle, seed packets, extra long craft sticks, candy, wiggly eyes, a low temp glue gun and some constructions paper. To make long leaves cut a skinny leaf shape and hot glue two sicks to the back of the paper so the entire leaf is supported. Hot glue one stick to the back of the seed packet. We made cool bugs on our leaves by hot gluing together gumballs and wiggly eyes. 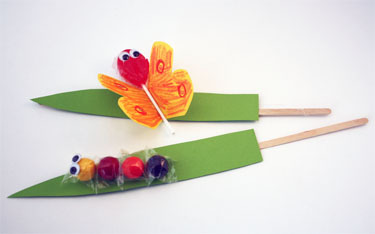 The butterfly is a piece of child decorated construction paper with a sucker for the body. A child made label dresses up the can perfectly. Drill holes in can on each side near the top and use part of the coat hanger for the handle. Fasten the label to the can with a bit of hot glue. 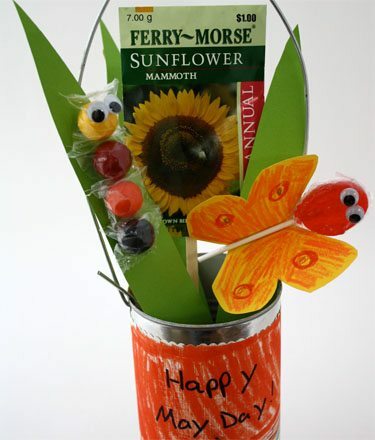 Fill can with candy and add leaves and a “flower.” Now you have a fun (and useful) May Day Basket. omg, too cute! I love the caterpillar! This is sooooo cute! We may end up making some for Mother’s Day gifts. This is SO cute! I think my son and I may be making these for May Day! I would love to link this to my blog! Oh my gosh!!! 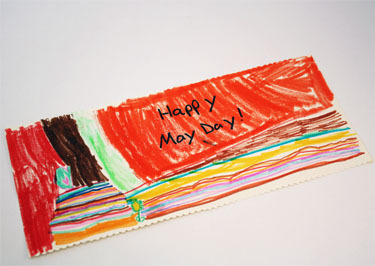 This is the cutest May day project EVER!! What an earth-friendly idea. I hope to use it next year! This is so cute. I am going to help my grandsons make these for their Moms! 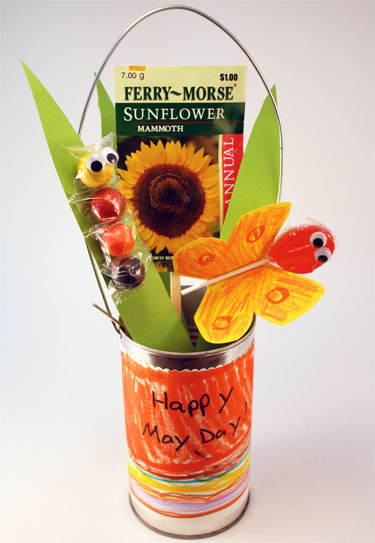 This is the cutest May day project EVER!! What an earth-friendly idea.We may end up making some for Mother’s Day gifts.